She Called Me by Name. 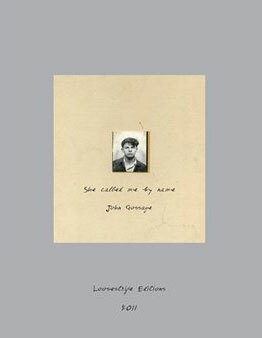 Loosestrife Editions, 2012. 36 pp., 18 duotone illustrations, 20x17". 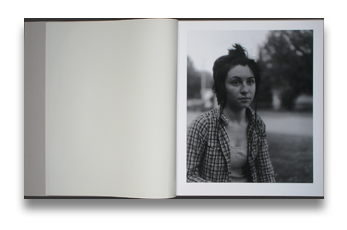 Portraits of the adolescent artist, is the subject of this unlikely new book from John Gossage. Well known for his attention to the edges of the urban landscape, in these photographs Gossage turns his insightful gaze to the formal portrait. This series first began in 2009 when invited to the Rochester Art Center in Minnesota to photograph its inhabitants for a project published as “Here... Half Blind.” The intense world of the young artist fits well into the photographer’s fascination with places at the edge of mainstream America. This tribe is presented at an age when they are balancing the uncertainty of youth and the conviction demanded of an artist. The work is Gossage’s attempt through the portraits of others to understand the earliest moments of his own life as an artist. The oversized 20x17” scale of the images creates an innovated book experience that requires two hands to operate. The 18 images remind us of how brave one must be to become an artist. Read Adam Bell's review of She Called Me By Name on photo-eye Blog. In Stock! Usually ships in 1 business day. What is an imperfect book?